I love answering reader questions. I thank you so much for giving me ideas on how to improve my hospitality department. I am in a small church and the hospitality department its only 6 of us. Is it ok to have the refreshments two Sundays a month or every Sunday after service. I teach that your small church should have a small reception after a morning service. Larger churches may already have this built into the their structure, but I keep encountering smaller churches that wrestle with this question, mostly because they don’t get many visitors, or they have budget considerations. 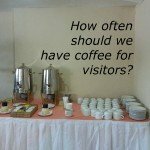 How often does your church have visitors? Then I’d recommend every Sunday. The outreach idea behind this reception is to create a context where your church visitors can get to know you. They may not stay for the reception, but you’ve at least made it available. Ministry with visitors can happen, such as leading a visitor into a relationship with Christ (read about it), or allowing the visitor more time to learn more about your ministries and mission. When we visited a church reception for a few weeks, it lead to some new friendships when someone chose to invite us to Sunday school. The Sunday morning worship is usually a one-way experience where your visitor is consuming the experience. A reception after the service allows this to become a two way experience. For your church, this reception should be a vital part of your outreach. Your coffee time doesn’t have to be elaborate. It can be as simple as waters, juices, and crackers. I recommend every Sunday because it’s part of the welcome mission of the church. 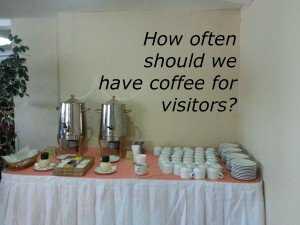 If your church doesn’t get a whole lot of visitors, then there may be other issues to work on. If you have a question about a hospitality practice, feel free to ask me a question. Do so via this form, or in the comment field below.